The State of Colorado regulates controlled substances like others, but there are some variations in how controlled substances are defined in this state. It’s not just the common substances such as marijuana, cocaine, heroin and methamphetamine that are deemed controlled substances. Colorado includes all compounds utilized in the manufacturing of them as well as paraphernalia such as pipes. While Colorado has enjoyed the tax benefits of the regulated distribution of marijuana for the last few years, state officials remain vigilant against unregulated sales of controlled substances, which include marijuana. Just because a dispensary sells marijuana legally does not mean just anyone is authorized to legally distribute cannabis products. Doing so leaves you open to a variety of criminal penalties based on a few factors, including the amount you possess. Colorado treats these as Class 3, Class 4 and Class 5 felonies, depending on the situation. For instance, the sale of fewer than five pounds of marijuana concentrate is a Class 5 felony carrying a possible sentence of one to four years in prison and fines ranging from $1,000 to $100,000. The consequences can be worse if you’re convicted of Class 4 and 3 felonies. Even if you don’t intend to sell marijuana in your possession, you could be arrested for having too much. In Colorado, owning 8 ounces or more is considered possession with the intent to distribute. This can enhance a controlled substance charge. 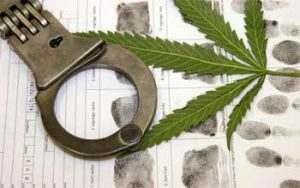 While illegal possession of 2 to 12 ounces is considered a misdemeanor, which does not exclude the possibility of heavy fines and incarceration, possession of 12 ounces or more of marijuana for personal use is a felony with a maximum fine of $100,000.Distributing marijuana without proper licensing or producing marijuana without proper licensing can lead to severe civil consequences and felony charges. Visitors and residents of Colorado have access to marijuana through state-regulated dispensaries, and it is legal to possess as much as an ounce of cannabis in this state. That right is not extended to federal lands. The federal government owns roughly 24 million acres of land in Colorado, which is more than a third of the state’s total acreage. This includes national parks, monuments, recreation areas, trails, national forests and historic sites. This means you have a better than 1-in-3 chance of being in the wrong place with the wrong substance in your pocket, vehicle or backpack. Your first illegal possession offense on federal lands is a misdemeanor and punishable by one year in prison and a $1,000 fine. A subsequent offense brings a misdemeanor charge and mandatory minimum of 15 days of incarceration and a maximum of two years. A third offense has a 90-day minimum sentence and can be considered either a felony or a misdemeanor. Sale and cultivation of cannabis on federal lands carry heavy fines and harsh prison sentences. Colorado marijuana laws can be complex and could lead to harsh consequences if you are deemed a habitual offender. If you’ve been charged with a controlled substance offense, you need to speak with a Denver attorney who understands the intricacies of Colorado drug laws. They can help you defend yourself against the state or find ways to soften the inevitable harsh punishments that are otherwise awaiting you. There are a few factors prosecutors in Colorado must prove to convict you of illegal controlled substance possession. You simply have to know the drugs were present, regardless of your knowing whether or not they were illegal. Prosecutors must also prove that you had the controlled substance in personal custody. This could include being in your pocket, in your vehicle, in your luggage or hidden within your home. The next item in cases involving more than one defendant is shared possession. If law enforcement officers find a controlled substance in your home, it must be proven that you had at least partial control over the controlled substance. Under the Fourth Amendment of the U.S. Constitution, there are limitations to the ways in which law enforcement officers may search for controlled substances. If it is found that they violated your Fourth Amendment right against illegal search and seizure, the evidence may be suppressed leading to a dismissal of charges. There are other factors that could be used to defend your freedom, and it takes an attorney with a sophisticated understanding of these procedures to help your case. Denver defense attorney Richard Huttner has helped thousands of clients from Colorado’s Western Slope to the Front Range retain their constitutionally guaranteed rights in the face of criminal charges. Richard focuses on the factual evidence and has successfully challenged the conduct of police who may have used coercion or other means that trample your constitutional rights. If you have been charged with possession of a controlled substance, Denver defense attorney Richard Huttner will thoroughly investigate your case, consult with forensics experts and other specialists, and fight aggressively to defend your rights in the courtroom. He will do everything possible to protect your rights and make the government prove the case beyond a reasonable doubt. Set up a free consultation with Richard to learn how you can defend your rights and freedom.